2) WHO’S YOUR NATHAN? YOU NEED AN EDITOR! Nathan the prophet was a gift to King David, giving him counsel on issues from architecture to music to succession and, most importantly, the heart of the king himself. David’s life was not right, and his heart was not right with God. Without Nathan, David would have continued his adulterous, murderous behavior, ultimately corrupting the Davidic line. o Galatians 6:1 Brethren, if a man be overtaken in a fault, ye which are spiritual, restore such an one in the spirit of meekness; considering thyself, lest thou also be tempted. Some people want to catch you in sin. Nathan tells this story about sheep and injustice because Nathan wanted David to catch himself in his sin. 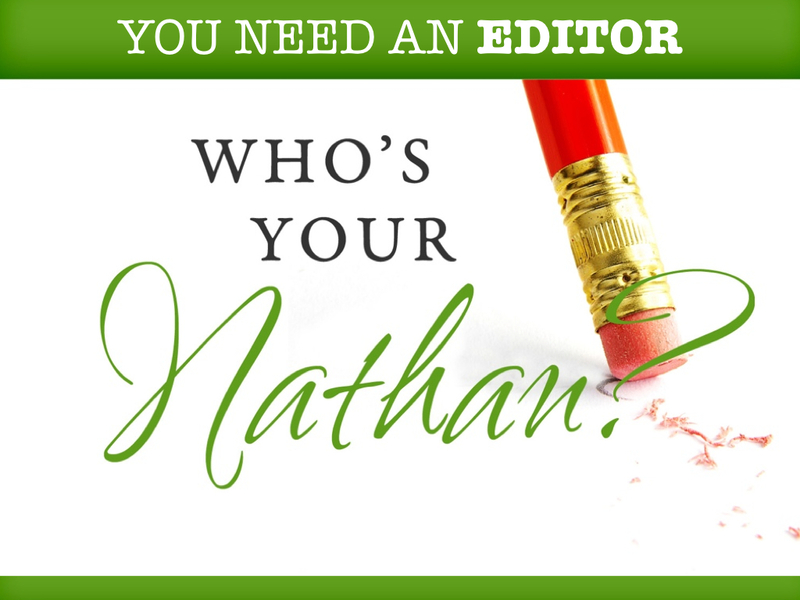 The role of a Nathan kind of sounds like an accountability partner, but its different, the Nathan in your life is an editor of who you are. Generally accounting is to find mistakes. An editor loves who you are, loves what you are trying to do but is able to speak truly from their heart to you to make you even better. The more you allow God to use you, the more you need a Nathan, to edit your emotions, your drive, and your heart condition. Who is your Nathan? Who has the authority to haul you before the tribunals of truth? The name Nathan means “gift”, this man Nathan was a gift to King David redirecting his life and rescuing him from the path of destruction that he was on. This series is loosely based off Leonard Sweet’s book by 11: Indispensable Relationships You Can’t Be Without and the preaching notes of my friend, Shawn Stickler, Lead Pastor of The Pentecostals of Quinte in Belleville, ON. I have also personalized these outlines with my own thoughts and stories. LESSON ONE: WHO’S YOUR JONATHAN? YOU NEED A TRUE FRIEND! LESSON TWO: WHO’S YOUR NATHAN? YOU NEED AN EDITOR! LESSON THREE: WHO’S YOUR JETHRO? YOU NEED A MOTIVATOR! LESSON FOUR: WHO’S YOUR DEBORAH? YOU NEED A PROTECTOR! LESSON FIVE: WHO’S YOUR BARNABAS? YOU NEED AN ENCOURAGER! LESSON SIX: WHO’S YOUR RHODA? YOU NEED A LITTLE ONE! LESSON SEVEN: WHO’S YOUR PAUL/PETER? YOU NEED A MENTOR! Posted on July 21, 2014, in Friends of the Bible Series, Ministry Monday. Bookmark the permalink. Leave a comment.